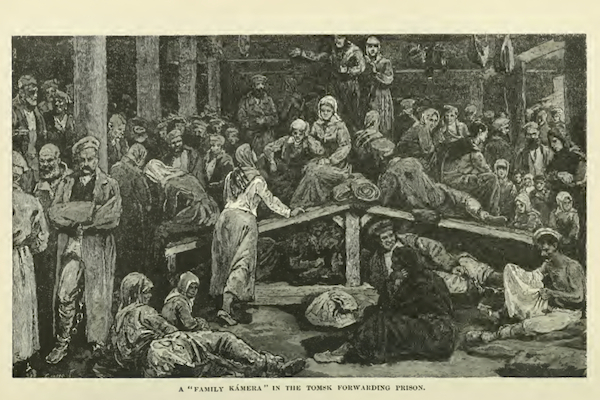 Whilst planning a section of my chapter on pre-revolutionary works on Siberian prison and exile, I’ve been considering the role of images as well as the words, as many of the books I’ve been reading – at least most of those published after around 1880 in the UK and the States, and after around 1900 in Russia – are extensively illustrated. Partly to make my own examination of these images easier, and partly as a general resource, I’ve created a flickr album of the ones I’ve collected so far. A list of the books from which they’re taken is given at the bottom of this post, and I will continue to add to it. The one notable absence at the moment is Vlas Doroshevich’s Sakhalin: Katorga (1903), which I’m still downloading (most – although not all – of the images are on the wikisource version, and can be viewed on wikimedia: part 1 | part 1 mugshots | part 2), but in any case Doroshevich’s book is the subject of a different chapter, so it’s not so relevant to my work at the moment. 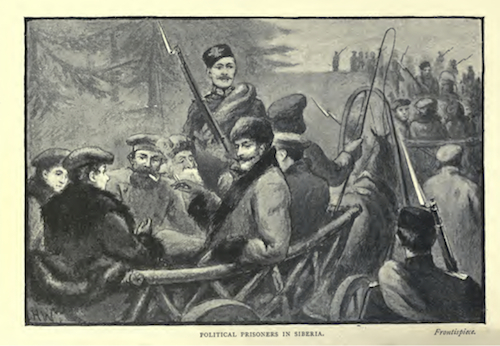 The images are of varying quality – in both senses – and for practical reasons I’ve so far only included ones that are directly related to the question of the penal and exile system, even though this means omitting some stunning illustrations, particularly from George Kennan’s Siberia and the Exile System (1891; his encounter with Buriat buddhists is an especially rich source of pictures). In some cases the mixture of images included is significant in itself. It’s notable, for example, that of the 36 illustrations in Henry Lansdell’s Through Siberia (1882), only six are of the penal system, supposedly the special subject of his visit, and one of these is of a place he didn’t visit. A transition from illustrations to photographs takes place around the mid-1890s. Some of the photos are very interesting, but there are a lot of repetitions of the same images in different books, probably because many (most? all?) 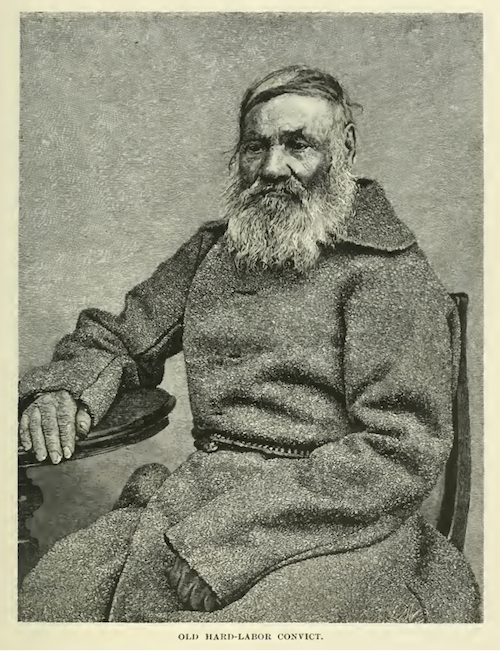 of them are official government photographs (Harry de Windt, The New Siberia, p. 24), which were undoubtedly the most readily available. 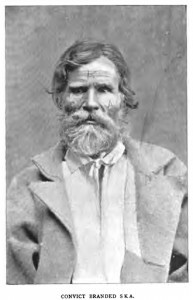 There were evidently two sets, one relating to Sakhalin, including the mugshots Doroshevich uses (it was apparently obligatory to include at least one of two pictures of the infamous convict Sophia Bliuvshtein in all books on Sakhalin), and another of more general views of convicts, prison and mine complexes – mostly taken at a distance. 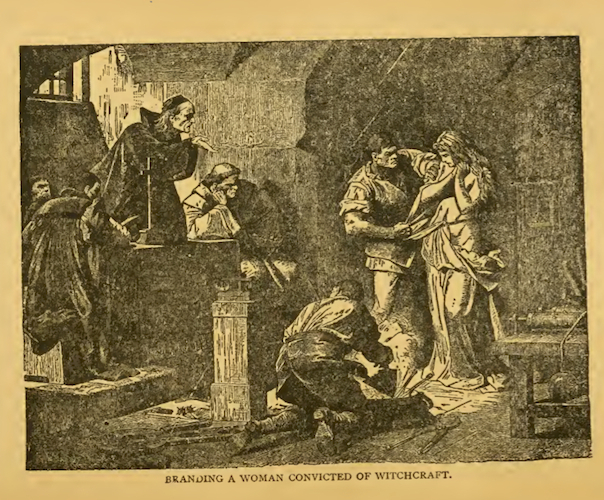 But even amidst the standard and recurring images, one still occasionally comes as a surprise, as did the above picture of a branded convict from James Young Simpson’s Side-Lights on Siberia (1898). It made me realize how rare it is to see evidence of that practice, which was largely eradicated before the era of official photographs. 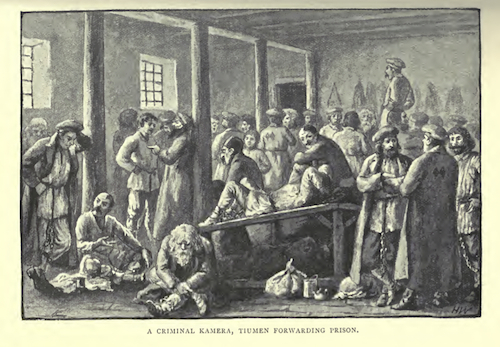 This scene of a criminal kamera (communal cell) at Tiumen forwarding prison from the same book is quite a curiosity. At a glance it looks more like a market square or tavern than a cell (and yes, one could go on about the prison as a carnivalized space, blah blah), but more noticeable to me is the treatment of everything that marks out these figures as prisoners. The chains look more like fashionable accoutrements than any sort of encumbrance, the diamonds on the backs of coats appear to be design details, and the two figures with half their head shaved more closely resemble Ukrainian cossacks than convicts. It’s as though there’s something else going on altogether – what Prince Myshkin might have described as ‘ne to’ (‘not that’; talking about the wrong thing). But what then to make of the hunched, bearded figure in the foreground? Strangely, the more I look at it, the more I think of Dostoevsky’s eternal Russian peasant – the Muzhik Marei himself, perhaps. And I begin to wonder if the figure with the hooked nose sat in the centre is Isai Fomich. This is nonsense, of course – de Windt does mention House of the Dead (or Buried Alive, as the first English translation was known), but I don’t think it’s doing him too much of a disservice to suggest that neither he nor his anonymous illustrator was sufficiently tuned into it to incorporate such references. 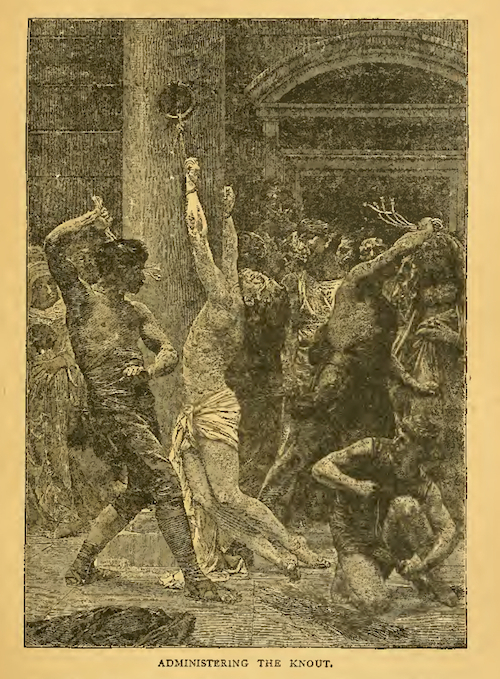 This picture in fact quite faithfully illustrates the use of the knout as reported by Buel, described to him by ‘a gentleman who had witnessed several such floggings’ (p. 281). But it bears no resemblance to the actual punishment, in which the victim was strapped to a horizontal ‘mare’ (kobyla – there’s a picture of one in Charles Hawes’ In the Uttermost East, p. 341) – and the reality of the punishment was terrible enough that one wonders why anyone would find it necessary to resort to such medieval fantasies. But in many ways it’s the style of the picture that is most startling – it resembles a religious scene (but Catholic rather than Orthodox), while the contrast of the victim’s whiteness and the dark-skinned executioners imparts a racial dimension for no apparent reason. … which looks like a scene from a Gothic novel set in the Spanish Inquisition, complete with titillation in the form of the virginal whiteness of the victim. It might all mean something if Buel was trying to advance some sort of argument, and when he then turns his attention to the pogroms, it looks for a moment as though he is going to say something that – however bizarrely – might justify this stuff. But nothing is forthcoming. It’s just a collection of outrages embellished at will to cause maximum outrage, and his text makes it clear (as do many of the other pictures) that he was actually far more interesting in bear hunting anyway. But this does raise the question of whom such works were written for, and whether they gained a substantial readership. There was a good deal of interest in the ‘Siberian question’, and certainly Kennan’s Siberia and the Exile System was widely read. A book like Buel’s, I suspect, had the potential to discredit the campaign against Russian prison conditions far more than those that simply denied any faults in the penal system, but was there really a market for this sort of trash? I’d never seen a reference to it until it came up in a search on archive.org, whereas Lansdell’s and de Windt’s books, whatever their shortcomings, are mentioned regularly – not least because these authors all refer to each others books – so perhaps it really did sink without trace. In which case, has digitizing it given it a status it never had, or deserved? And am I now now giving it more attention than it’s ever had? Probably, but it won’t get more than a few lines in my chapter. Returning to the question of illustrations, it is also worth mentioning Kennan’s books, illustrated by his travelling companion, the artist George Frost, mainly, it seems, from photographs the latter took during the trip. There’s nothing extreme or horrific about the pictures – throughout they seem to be balanced and in fact quite muted in comparison with the often harsh descriptions. There are some rather good portraits of political exiles – including both those they met and others they did not – and very evocative group scenes that look far more natural than the one from de Windt I discuss above. In the original article (open access) that forms the basis of my chapter, I argue that in Siberia and the Exile System, the peasant convicts are hidden from view. I still stand by that in relation to Kennan’s words, but Frost’s pictures, as these two examples show, tell quite a different story. George Kennan, Siberia and the Exile System (New York: The Century Company, 1891), vol. 1 and vol. 2.